Following on from the development pathway post I mentioned and my previous post explaining my approach to training, at the beginning of this season I modified our schedules, tailoring them to the under 19 squad. This involved making regular use of the three daily session slots as well as adding in regular endurance, quickness and resistance modules. I love players with great physical attributes so getting these sessions in while they’re young and still developing will hopefully benefit them down the line in their careers. I said in my player development post that there would be players that don’t follow the planned pathway. There would be some that would just look good enough to step up from the under 19 squad straight into the first team. Robalo is one of those players. With Murillo ruled out through injury and us playing matches every couple of days or so I needed some extra cover for Mário Ferreira on the right hand side. 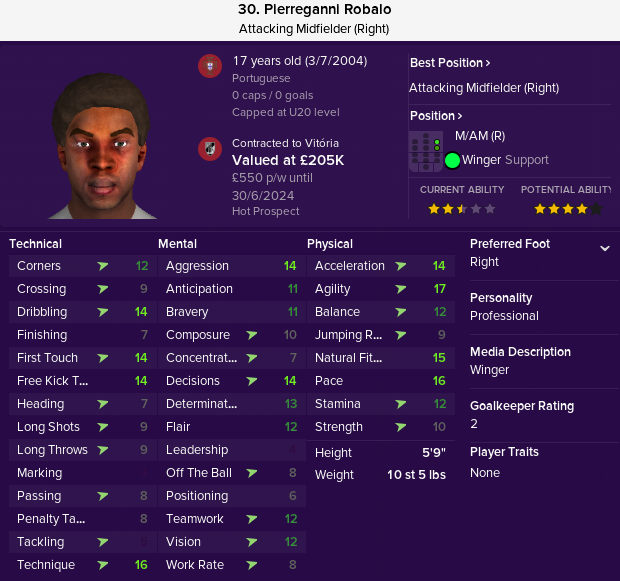 Robalo was spotted and signed in the summer from lower league side Uniao Sintrense for £200k up front and an extra £200k in potential add-ons. I can’t wait to see how he does after 17 goals and 17 assists in 44 youth matches ahead of stepping up to the first team in January. Martins came through the season three youth intake and is already showing some great signs of development in the under 19 squad. A few more years of youth football possibly followed by a season in the B team and he should be more than ready to make the step up. He attracted some interest from Benfica in January so I’m hoping I can keep him long enough for him to make the first team. In the current tactic, he’d play the DLP role in front of the defence. He’s training in that role and that should improve his defensive attributes for it, mainly tackling and positioning. What a name. 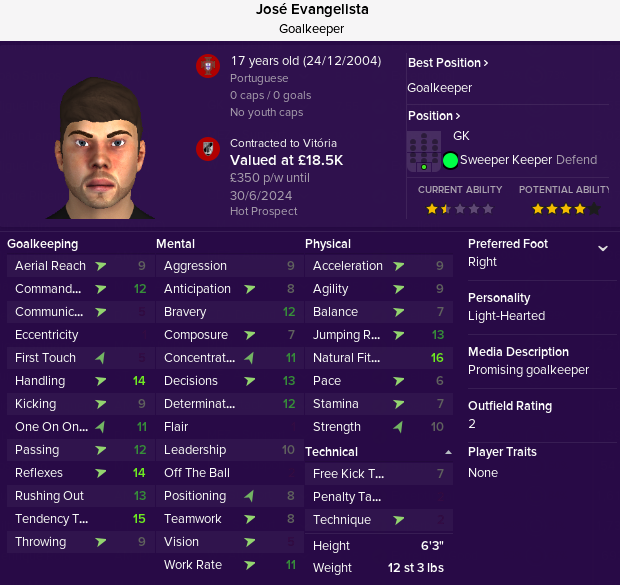 Evangelista came through the season three intake with Martins and is currently our most promising young goalkeeper. According to the coaches, he’s the most promising player in the under 19 squad at the current time. Keepers don’t get a lot of love sometimes, they’re often forgotten. I really hope Evangelista can continue on his current development curve and make the first team. He’s already got some great attributes, handling and reflexes, with a good command of his area already too. 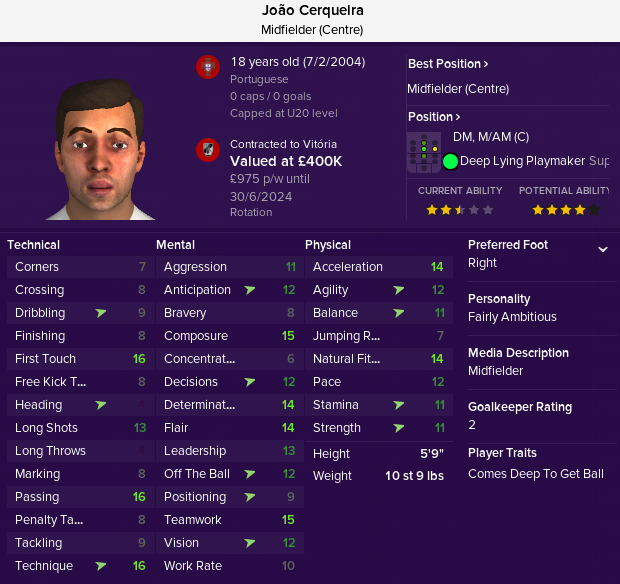 Cerqueira was plucked from Boavista for £500k in the summer transfer window. 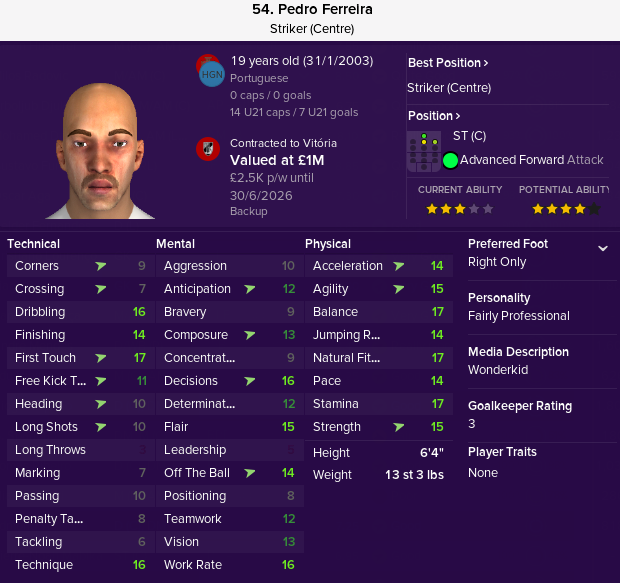 He has some incredible stand out attributes for his age, with 15 or above on his composure, passing, first touch and technique. I would say he’s probably ready to skip the B team and make the step up to the first team already in all honesty. One to watch for next season. Ferreira was another player plucked from one of our league rivals this season. He joined in January for an initial outlay of just £250k from Rio Ave, that fee could rise to £700k with clauses. He’s already made 36 competitive appearances for them before the move, scoring five, but he’s currently with our B team squad due to us already have three good options up top in the first team. I think he’ll be knocking on the door soon. 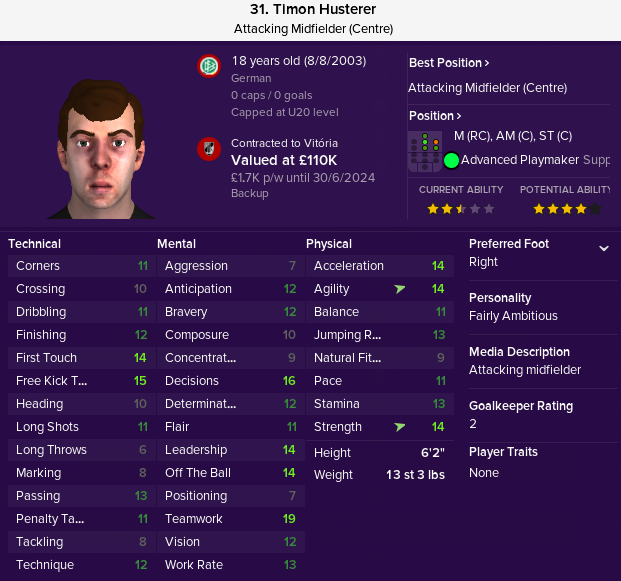 Husterer was prized away from 1860 Munich for just £120k at the beginning of last season. 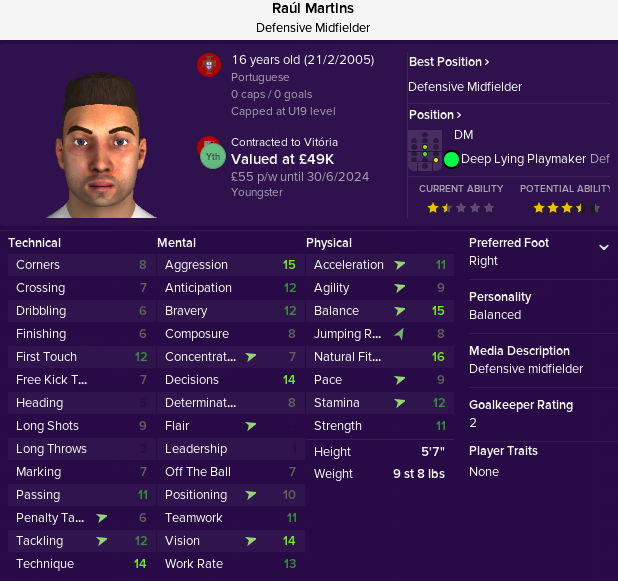 This season he’s attracted bids from Dortmund as he’s made the step up to the B team squad and impressed with a 7.13 average rating so far. He’s got plenty of room to improve still though, specifically in his technique, composure and passing, plus he’s not the most physically gifted player. Those things aside, I still think he’ll be very good if he’s able to make the jump up to first team football. 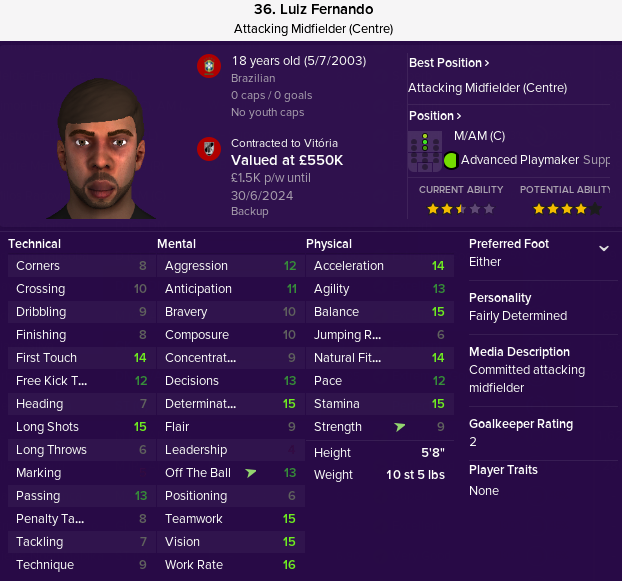 The star of the B team squad this season has been Luiz Fernando. He joined the club in the summer from Parana in the second tier of Brazilian football for his minimum fee release clause of £300k. He’s got seven goals and five assists mainly playing in the attacking Mezzala role in the midfield. He’s not perfect, his dribbling, finishing and composure could be better, but he’s got some good standout attributes too including those last three mentals plus his first touch, balance and long shots (ideal for the Mez role). I said it on Twitter previously before but I just naturally gravitate towards bringing in young players for cheap fees. There’s much less risk attached with those moves. They don’t cripple the club financially and more often than not actually benefit the club’s bank balance. 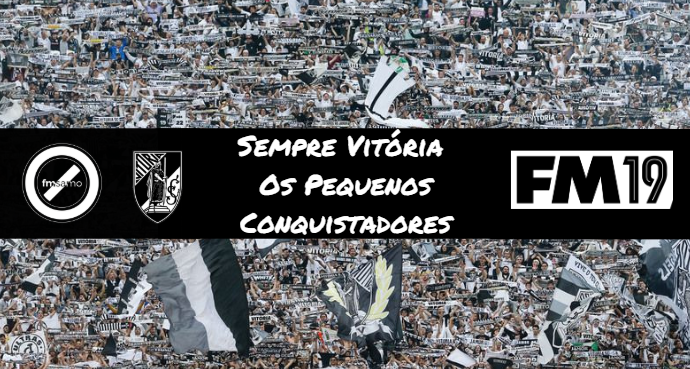 With Vitória though I’m putting much more emphasis on trying to bring through our own youth prospects too. The facilities, quality of coaching and quality of player are all there in front of me. It’s about having a little faith. If you liked this blog, or any others on the site, then I’d love you to consider donating to charity if you can. A few suggested links to some can be found below. Donate to Special Effect – finding ways to enable people with physical disabilities to play video games. Donate to Mind or SAMH – charities in England, Wales and Scotland providing mental health support and care. CALM – leading the movement against the single biggest killer of men under the age of 45 in the UK, suicide. It’s great exercise to take coaches with excellent grades for young players and those players put in championship of their level. It’s really best sport simulation ever. Although I’m not a huge fan of newgens – I really liked this as it’s linked to your club philosophy/player development pathway and ultimately to how you will use each player when the time comes.